This was given to me after I was shown an event which was on another timeline operating on their Jan 4 2005. It ended as an Armageddon type scenario. But it didn’t show in our timeframe for that date. However something of that nature may still happen to bring the two realities into alignment. I’m still working on the relationship of one timeline to another. I’ve seen supposedly extinct timelines re-animate when hope was revived for their remanifestation. It’s obviously complicated and all I can do is write what happened and learn from hindsight or more information as it happens. 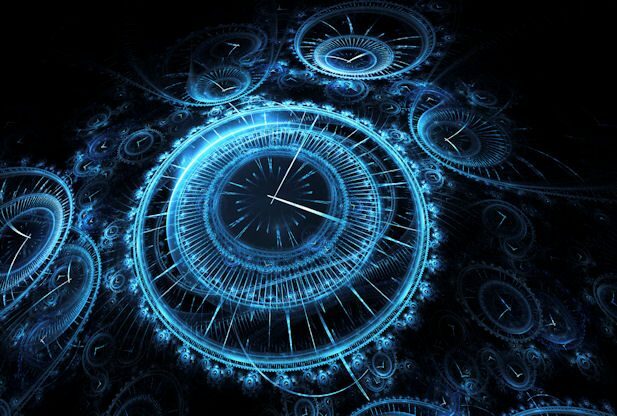 Time proceeds from a central spot within the universe. Forward time emanates from the mind and thoughts of God, as He thinks and creates and it pushes all events forward as He creates them – forward and outward. The result of this thought makes life itself grow. Life, in all its different manifestations, is then felt by God during growth and is then reabsorbed and felt through God’s heart. It is drawn backward into His heart and determined emotionally by God, as the creation feels its own existence. As life proceeds out of God’s mind, it expands as it is creatively moved and keeps expanding until it is perfect. Once perfect it is kept in Eternity as a permanent fixture in God’s mind. While imperfect and still in the process of evolving, the effects of the emotions and feelings generated are drawn back into God’s heart to be absorbed and felt deeply as to the true worth of the experience, both for the experiencers and the Creator of All. All the feelings from the experiences of all God’s creation, are drawn backward to a central point in God’s heart. As we feel, we join in God’s feeling and the more deeply we feel, the closer we get to God’s heart, because the closer we get to God’s heart the the more intense the emotions are felt as they evolve towards perfection. They also get divided into areas of types. As we feel, with the emotions becoming more intense and concentrated, we go backward in time to a central point and reach God’s heart in Eternity. Our hearts can feel Eternity if we can feel deeply enough. As we think ahead we go forward in time and get closer to God’s mind. As we become more able to think more perfectly through experience, we inch closer to Eternity where perfection exists. The more we think of God the closer we get to Him, because then our thoughts get inspired to rise higher above the limitations of the physical world and become more rarefied and fine tuned. Often people are heading in one direction or another, becoming more perfect by moving either forward or backward in time. If one can manage to do both equally exactly, then time stands still for them and they experience the stillness of Eternity. Eternity is where God resides and it is where the past and present merge in a completed circle. God loves it when we both think ahead and reflect emotionally, going backward in time, as it always leads closer to Him if we go with the natural current. Sometimes people think backward and feel forward which go against the current. This creates whirlpools in the flow of time for that person’s reality and they get muddled and confused with thoughts and feelings crisscrossing and getting mixed up with each other and chaos develops. Especially if they are also trying to think ahead and feel backward too. Feeling ahead can bring all fears to the surface of the consciousness and project fog of emotional origin into the perceptive view of reality, causing blurred vision, necessitating glasses in some cases. It is very hard to tell what the future holds in a completed picture, so it can’t be felt in advance very successfully, only the bad events looming, which sometimes project backward in time as they are prone to follow a backwards course naturally. Unless a great deal of emotion is projected ahead and maybe it is just one’s fears or desires are realized, however one can also pick up good feelings in advance, in which coming events project their shadows. Everything we do, creates a consequence in the future and these thought forms make their way back to us, unless we pray to remove them. Sometimes one attracts one’s heart’s expectations subconsciously, so it is better to clear away any unresolved emotional problems as soon as possible by reflection, so they are not projected ahead and drawn to us, as they go back to the source of origin. On the other hand, merely thinking logically about the past can distort it by imposing new sets of rules on it which would justify wrong acts by one becoming rational about them e.g. I was young and didn’t know what else to do. This takes away guilt, which comes from reflecting on the feelings of the past and shows us the truth of the matter more clearly than by looking at the outside of an event. A great way of getting rid of guilt and shame for wrong doing is to be really objective about the past and very philosophical – e.g. Oh it was probably meant to happen – such is life. This of course puts fog in the memories by recreating the event in a different form, as the mind has perceived it from another angle. So to be completely confused one can project their emotions into the future and think about the past. This is however, easily fixed. To clear fog in both areas – reset the mind and heart to go forward and backward the way God created them to be. The mind is masculine and expansive, always stretching forward and learning about the universe objectively. It is the Perfected Masculine. Onward and outward the mind goes, until it understands how creation works. This brings an understanding of what God is like, eventually leading to religious experiences, which acknowledge that there is a force greater than oneself – an awesome Intelligence which controls all. The feelings are feminine – rich, complex, colourful and deep. Ever searching for the source of love itself, reaching deeper and deeper into unknown experiences. Understanding how life operates from the unseen inside. Feeling all that life expresses, until finally one finds the source of all feeling and experiencing our Creator who feels all there is, was and ever will be. The perfected Feminine – a yielding to God as Master. To see the road ahead with projection of emotional distortions twisting the events coming forward, while in the same time frame experiencing the past mentally (seemingly as it occurred) with present perceptions distorting it – means one’s road forwards is as strewn with problems as one’s road backward. If one can aim for perfection, then the path traveled can be viewed as from the top of a mountain, clear vision in every direction. The path behind and the path ahead can be one. We are looking for both mental and emotional perfection. We would find it hard to find emotional fulfillment, just living by expectation of what we would hope to feel. Same with the mind – always thinking what has been, will not allow us to forge new totally original inventions or give birth to new ideas or aspirations from on high. So therefore we must be the way God designed us and be ever reaching closer and closer with both mind and heart to our Creator. When the past is re-experienced and felt strongly, things unresolved are dealt with and a person can come to terms with problems by confronting the right interpretation and bring about closure. They can let go, to experience the present situations more vividly without the heaviness of the past distorting the flow of feelings towards others. We need to let go emotionally and experience all we have ever been, including past lives, which will arise naturally, once the emotions are free of blockages – and then we can clear the past and be free of it. Because all unresolved issues appear in the future as events. The future is woven from the past and as the strands are stretched out before us as possibilities, (on different timelines) all it needs is for someone else to place an event before us, and it may be woven into our future – into the awaiting strands, if it meets the pattern requirments. When the past is cleared, the future appears as a clean slate, and we can create anew with our thoughts and reach the ideal world of perfection in Eternity. Aug 1999. I am finding out how my vision of Jan 4th 2005 manifesting on another timeframe was created by an angel for me. Seven years were opened ahead from a time wave of that length. Time waves like a biorhythm chart and when the lines cross, an event is caused. Time for our personal reality starts in seven year cycles from the moment of birth. Time runs in a three strand biorhythm. Only every seven years do the mental, emotional and spiritual lines unite and open a vortex to the other seven years that they crossed previously and will cross, in the future. This links up to a 21 year cycle, of which events are decided by God’s Will. Certain events on the seven year markers that transpire, are God’s Will as well. We are allowed to choose the subroutines that exist off the lines but can’t control the seven year markers which operate like a flow chart. If we go off into a tangent, we just go around in circles in life, until we get back on the right path, determined before birth. My mental, emotional and spiritual cycles were united when I was given the view of Jan 4th 2,005 on another timeline, and I stepped into that time through a vortex which opened and connected to the next time they aligned and that is why I got that day in the future. Each cycle makes a certain sound or frequency when they cross and a particular note is produced. It resonates with all the other times it made that pitch and links with it by tuning fork effect. All the other pitches, which are the same link up – like join the dots. The sound goes back and forth in time and meets itself every other time it made the same connection. These same notes reinforce each other, to make a long line of sound that bores through the space time/continuum. However these biorhythms affect everyone and resonate to a particular activity, which draws by magnetic attraction all individuals to those areas, that their particular energies resonate to. What happened with me is I jumped to the next intensified point where things are brought to a head every seven years. Though the different mental, emotional and spiritual levels vary in their highs and lows, they meet every seven years to reinforce the pattern, the life is molded upon. Certain events are created for someone’s life which propel it along a certain course. Others, who are drawn to us along certain similar experiences, are resonating to one or two of the same patterns we are moving along to initiate activities which develop either mental, emotional or spiritual activity. One is usually developing one strand of this biorhythm at a time to strengthen it, so we may be progressing either mentally, emotionally or spiritually at a given time. However, we can do two activities together if two of the three particular “time” lines merge for a length of time, to enable a composite experience. When the lines join up every seven years, our spiritual vehicles go through changes, as to which particular ones are occupying our consciousness. We may pick up the future (either mentally, emotionally or spiritually) from any of the three strands if the spiritual vehicle occupying our consciousness, during that phase, is perceptive enough to tune into events along the coming biorhythmic activity as long as the others parts of our consciousness are not interfering. e.g. if we pick up the future emotionally, we may be picking up fears realized that we have projected into the future and are heading back to us if we have an emotional line up at the time of our spiritual vehicles for part of the seven years between cycle completions. But we don’t necessarily have to have that future, as we can get rid of it, now that we have been forewarned. We may pick a better form of the emotional future, which can be a karmic reward for good emotional deeds, which would be more true as to it’s predictive worth. I believe we may pick up the future mentally too if we have the correct mental vehicle dominant in our consciousness and our being developed for that cycle – uncluttered by reminiscing on the past mentally and with thought progressing in a forward direction. We can see which pre-ordained events are on that mental development line, when the mental activities are active. Our minds would be sharp, and able to logically deduce the future, by using advanced logic. In summary it would appear that some parts of the future may be perceived, due to events that are pre-ordained projecting into the consciousness, if the person has the right spiritual vehicles aligned within their consciousness, at that particular point in time, which can perceive their own future, either in a mental, emotional or spiritual activity. So we can tune in to areas, which we are at present working on, as a kind of extension of that timeline we are actively developing, if we can keep other parts of our consciousness quiet. We will all be ‘on’ a particular part of the 3 fold time at any given time, it’s a matter of fine tuning to see what is on it, as necessary experiences. However we can sometimes see this symbolically, by imagining a road ahead, and then the events and activities will show in a sort of animated form as ‘our future’. These may not necessarily come true, but possibly if we don’t heed the warnings. For example we may see a car crash, so we need to take more care, as this can happen, due to current karmic unresolved issues building up. We can change our attitude, to drive carefully, and then the animation will change to see us narrowly avoid a crash. This means that to see the whole of the future on a date, at any given time, can’t be achieved easily – though certain events may come true. This may be why, when we have dreams of the future, sometimes only some of it comes true. It appears that multiple possible futures are converging into one united timeline. Posted in MistyTagged Philosophy, New Age, Reality, Thought, God, Emotion, Christianity, Mind, Universe, Creator deity, Time, Nature, PerfectioncommentLeave a Comment on What is Time?